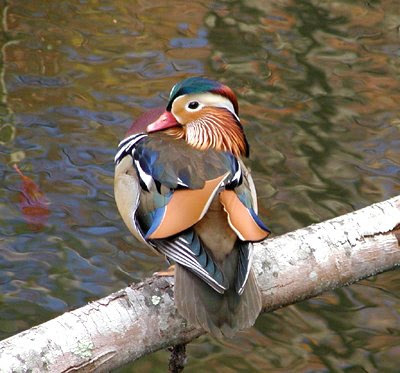 As you may recall, Harold and Nelva are our Asian Mandarin duck couple that has decided to live here at the Inn on Mill Creek (named after a super couple — Dave’s grandpa and his wife). We were concerned when they were away for a couple of weeks this month. We figured that they must be on vacation at a higher elevation since the temperatures were reaching into the 80s at our elevation in mid-June. However, we learned the real reason for their absence when they returned. It appears that Harold has a new hairdo (featherdo?). Actually, he molted — in other words, he shed his beautiful bright plumage. 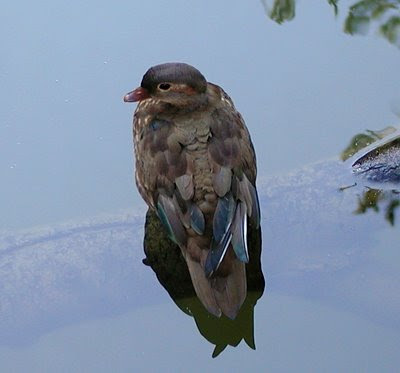 We’re told that during molting, ducks generally lay low and might not be able to fly, which would explain why Harold was not making his daily and evening commutes across the Pool Garden. Not to worry: Molting is a normal process in Asian Mandarins and Harold will grow more colorful feathers for us and our guests to fawn over. I said, just a little off the top! This entry was posted in Uncategorized and tagged birding, flora and fauna by Inn on Mill Creek. Bookmark the permalink.